I spent some more time testing the SideKIC over the weekend. I am really enjoying this sous vide cooker because of the sweet, sweet combination of its compact size, its ability to circulate water, and its overall aesthetic. While enjoying those factors, I think there is another element that should work really well with folks who want to cook sous vide. The oft-overlooked UI. The basic operations of the SideKIC are really simple. You configure the SideKIC using the click wheel and the GUI. Set your temperature and then click start. The heater will activate and you will see and hear the pump circulating water. 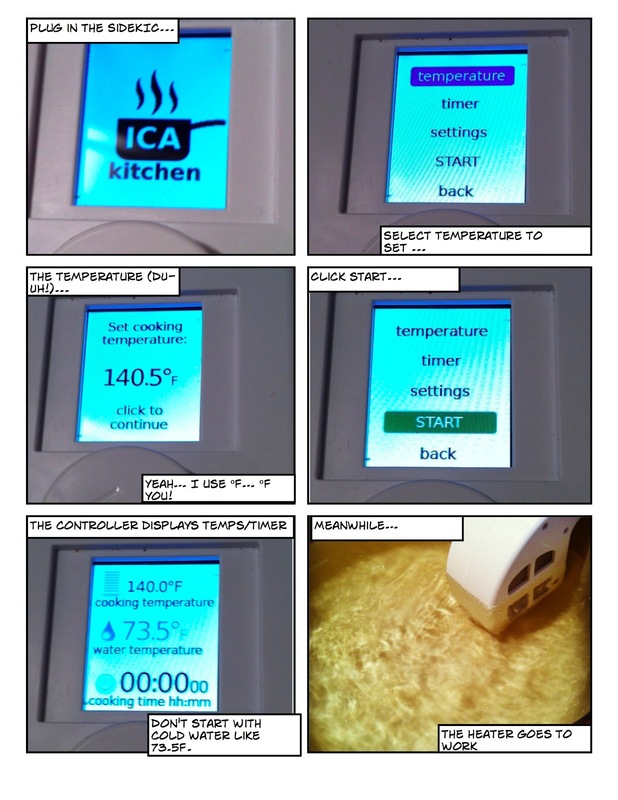 The controller will display the target temperature, along with the current temperature. The positive side of the water pump that is used by the SideKIC is that it is really quiet. Other immersion circulators I have used make a fair amount of noise. This is pretty important for a home kitchen. The design of the SideKIC does have some builtin limitations and challenges. Since the heater is not designed to be fully submerged, you need to be somewhat precise about the amount of water you put into the vessel. The documentation says that the correct water level is between the two "windows" on the heater. This creates a couple of situations where you can make a mistake. The first is that the amount of water you initially add has to both be at the right level during the initial heating as well as after you add the food you are cooking. It's easily fixed by removing some water, but since it was the first mistake I made, I thought it was worth mentioning. The other place where I had some challenges with the heater was in its stability hanging on the edge of the pot. Sometimes, the heater would be tilted in one direction or another. One of the causes of this was the length of the cabling that connected the heater to the controller. There were a couple of times where I moved the controller a tiny bit and ended up bringing the heater with it. The length of the cabling is also a challenge in that the controller is not supposed to get wet, but the length of the cable keeps it really close to the water vessel. I think it would be awesome if a future model had a clamp to keep the heater in place and level. 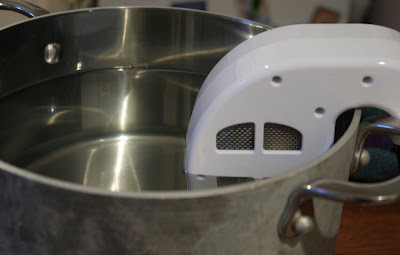 Another option would be to put something against the back of the heater (by back, I mean the side of the heater that faces the inside of the bowl) that can help keep the device level. Another limitation to be aware of is that it has a maximum temperature of 185ºF. This won't have much of an impact on meat cookery, but there are places (e.g. some veg, fruit and dessert-y applications) where this could get in the way. All in all, these are incredibly minor issues, and it is important to remember that the SideKIC isn't going to be pin compatible with appliances that are two to four times more expensive. The SideKIC is easy to use and has produced the same quality food that I've gotten when I have used or reviewed other sous vide cooking devices. 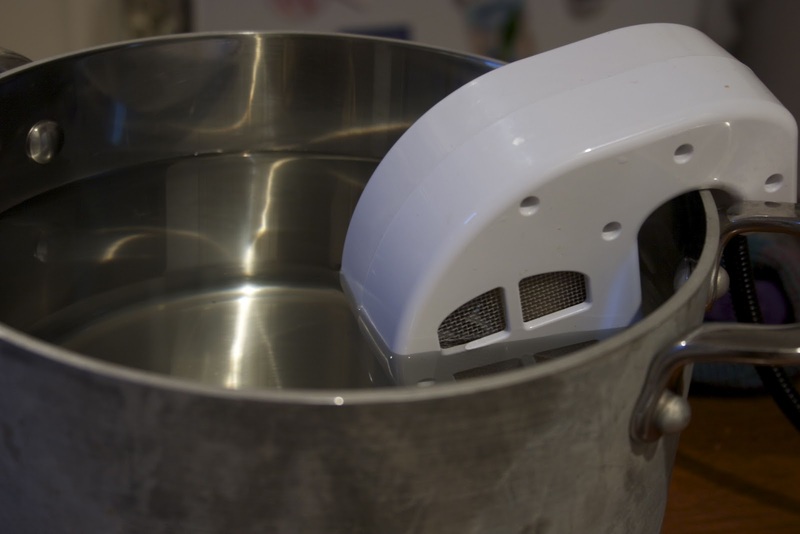 I have already recommended it to one of my friends who wants to experiment with sous vide but has some incredible space constraints (*) in his kitchen, but doesn't want to commit to a Polyscience Sous Vide Professional. Next up will be some stats on my experiences with initial heat up and stabilization after dropping the water temperature using a frozen block of beef. (*) If I ever start a band, it shall be called "The Incredible Space Constraints"
Why Josh Ozersky Should Boycott Chik-fil-A.